Visit the National Complete Streets Coalition website to download the 2019 Dangerous by Design report — and use an interactive map to find the most dangerous streets near you. PLUS: Scroll down to see a report slideshow and information for how you can see and share photos of "dangerously incomplete" streets. Published by Smart Growth America and the National Complete Streets Coalition, with support from AARP, the American Society of Landscape Architects and the consulting firm of Nelson\Nygaard, the report's Pedestrian Danger Index measures how deadly it is for people to walk based on the number of people struck and killed by drivers while walking. The report is based on traffic deaths that occurred between 2008 and 2017. Between 2008 and 2017, 49,340 people in the United States were struck and killed by drivers. That’s more than 13 people per day, or one person every hour and 46 minutes. It's the equivalent of a jumbo jet full of people dying every single month. In the past decade, the number of people struck and killed by drivers while walking increased by 35 percent, with 2016 and 2017 as the two highest years on record since 1990. Traffic deaths impact every community, but older adults, people of color, low-income communities, and cities and regions across the south bear a higher share of this harm. The 20 states with the highest Pedestrian Danger Index ratings are Florida, Alabama, Delaware, Louisiana, Mississippi, Georgia, New Mexico, Texas, Arizona, South Carolina, Nevada, Tennessee, North Carolina, Oklahoma, Arkansas, California, Missouri, Maryland, Michigan and Kentucky. Why is this happening? We’re not walking more, and we’re barely driving more than we were back in 2008. 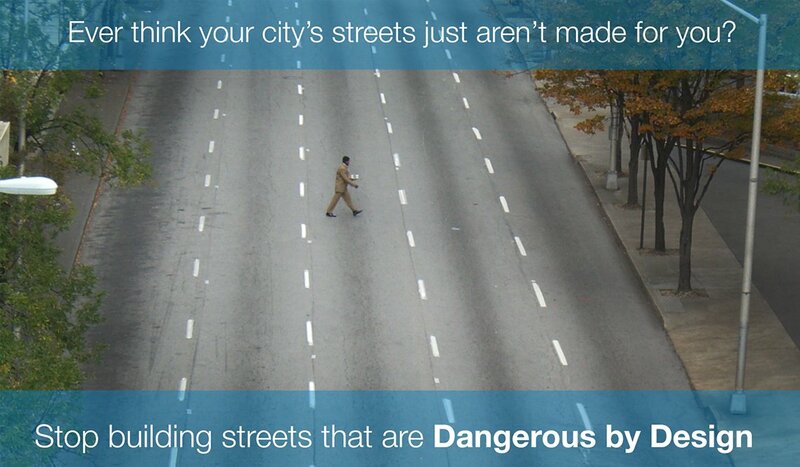 What we are doing is continuing to design streets that are dangerous for people. See some key findings from the report as displayed in the slideshow below. Scroll down for related links, including to the complete report. When roadways are created for cars and trucks, even nearby places (such as a coffee shop across from the office) are inaccessible to pedestrians who aren't speedy steppers with a talent for being able to avoid traffic. 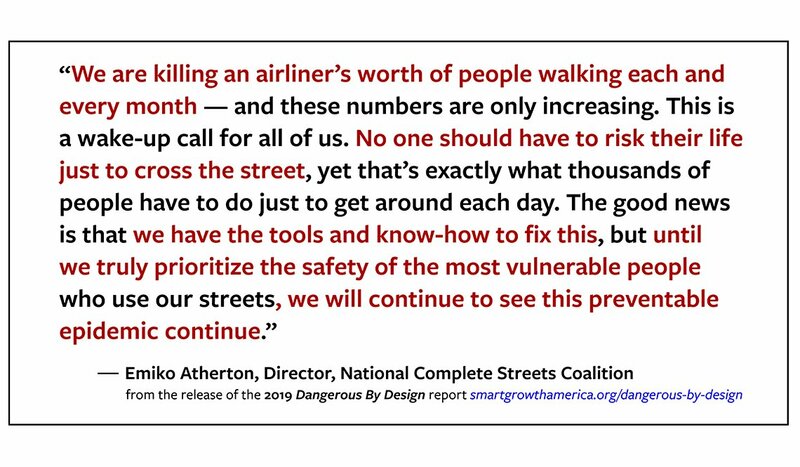 The images and graphics in this short slideshow are from the latest Dangerous by Design report and related materials developed by the National Complete Streets Coalition. 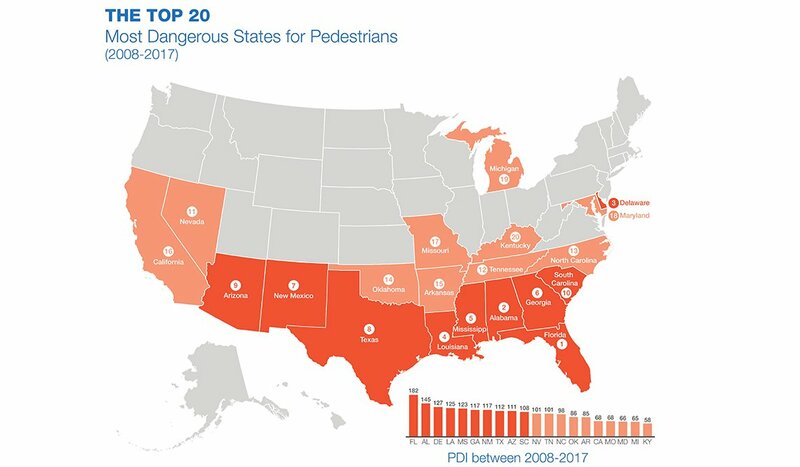 The top 10 most dangerous states for pedestrians as noted in the 2019 report are the exact same states called out in the 2016 Dangerous by Design report, although the rankings have shifted slightly. As was true before, Florida tops the list. The states in orange were the most pedestrian-unfriendly between 2008 and 2017. 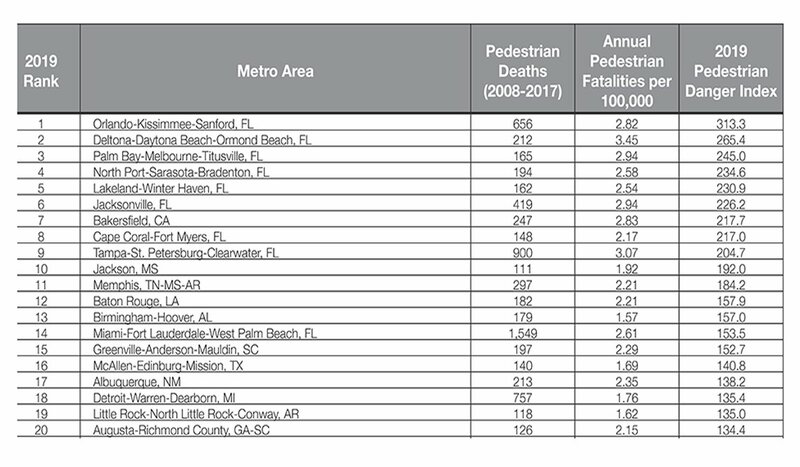 Florida is home to eight of the 10 most dangerous metropolitan areas in the nation for pedestrians. (Orlando-Kissimmee-Sanford area tops the list.) 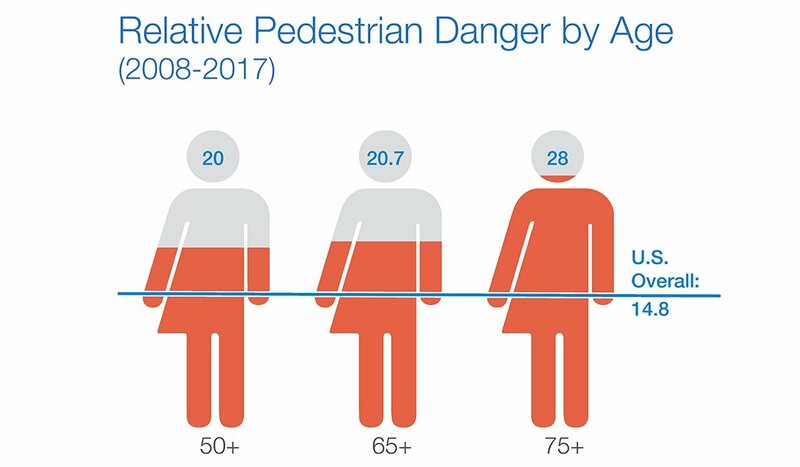 Four out of every five metropolitan areas grew more dangerous for people walking since the previous edition of Dangerous by Design. 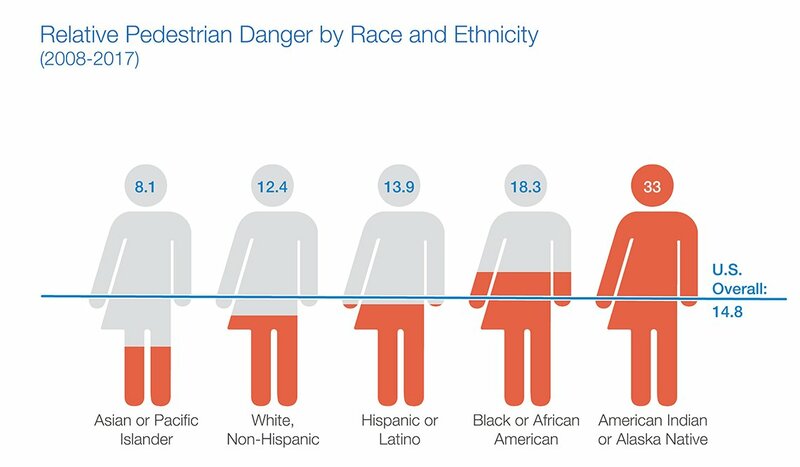 People of color, especially black and Native American people, die while walking at higher rates compared to white and Asian people. In addition to citing more dangerous roads near communities of color, research by the University of Nevada has shown that drivers are significantly more likely to yield to a white pedestrian in a crosswalk than to a black pedestrian. Follow the links below to download and read the 2019 Dangerous by Design report, see a slideshow of "dangerously incomplete" streets and a single photograph that shows what a complete street is — and why we need more of them. See a slideshow of "Dangerously Incomplete Streets"
See an example of a "Complete Street"
Adapted from the executive summary of the Dangerous by Design 2019 report. Read about the 2016 and 2014 reports.